Commencing only four years ago, in 2008, the University of Minnesota Honors Program is the top new public honors program among the fifty major university honors programs we evaluated in A Review of Fifty Public University Honors Programs, published on April 18, 2012. Making the good news even better is the fact that the program is also considered a large program with its 2,400 students. The average size of the fifty programs is about 1,800. The UM Honors Program is ranked 9th in Overall Excellence, which considers honors curriculum, prestigious scholarships, graduation rates, honors housing, study-abroad programs, and priority registration. UM Honors is number 11 in Honors Factors, a category that gives greater emphasis to honors curriculum and other features, while excluding the prestigious awards from the evaluation. Some prestigious awards are not earned by honors students, and some honors programs, especially newer ones and those that must operate in close proximity to the private elites, face special obstacles in earning Rhodes, Gates, Truman, and other awards. However, this does not appear to be a problem for UM Honors. An honors student in astrophysics at UM, Grant Newton Remmen, was recently named one of only 15 winners of the highly-prestigious Hertz Fellowship, which provides up five years and $250,000 to support for its Fellows to use in pursuing doctorates in science and engineering. Admission to UM Honors is somewhat flexible because the program tries to admit students from most of the separate colleges. Students in the STEM subjects may have a higher bar, for example, than those in other colleges, although STEM students are obviously well-represented in the honors program. Our estimate is that the SAT average is around 1375, and the ACT about 31. Though the University Honors Program is still new, it is already impressive in many ways. 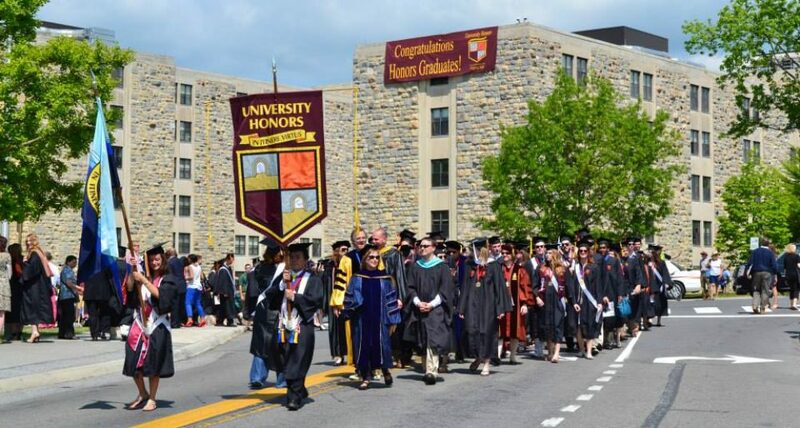 Honors requirements include at least 21 to 24 hours of honors course work and thesis along with seven honors “experiences,” which may be in the form of additional course work, faculty-directed research or creative projects, study abroad, internships, additional foreign language study, and community or volunteer work. Most experiences must be approved by honors advisors. The freshman requirement is six hours of honors courses and two experiences. Sophomores add another six hours of course work and two more experiences. Juniors must complete one course and two experiences. Seniors complete at least one course, a thesis, and an additional experience. The UM Honors site has much more information about what can be considered a non-course experience. UM ranks seventh among the 50 universities under review in the strength of its academic departments, as measured by a national survey of all universities, public and private. Exceptional departments include psychology (8), economics (10), business (14), political science (17), math (18), sociology (20), chemistry (21), along with engineering, history, physics, and earth sciences, all ranked number 26 or better nationwide. UM ranks ninth among the 50 universities in the attainment of prestigious scholarships. UM is eighth in Rhodes Scholars, sixth in Churchill awards (which emphasizes STEM subjects), and fifth in Truman Scholarships. UM has also done extremely well in the undergraduate Goldwater awards, also representative of strength in the STEM subjects, and added an impressive three additional Goldwater awards in 2012 alone. UM is one of 17 universities in our review that has been designated as a Truman Scholarship Honor Institution. An important feature for honors students is that the Office of National and International Scholarships is a service of the University Honors Program. UM is also one of only eight universities under review that received the highest possible score in the study-abroad category. The university has received national recognition for the total number of undergraduates who participate in study-abroad opportunities, for the average duration of studying abroad, and has received special recognition from U.S News for its study-abroad programs. The residence hall site says of Middlebrook that “it is near downtown Minneapolis and the Hubert H. Humphrey Metrodome–home of the Minnesota Vikings. The West Bank offers various theatres, music clubs, coffee shops, co-ops, historic buildings and ethnic and vegetarian restaurants. An important feature is that the Information Desk at Middlebrook is open 24/7. This entry was posted in Honors Curriculum, Honors News, Honors Residence Halls, National Rankings and tagged University of Minnesota an emerging leader in honors education, University of Minnesota best new honors program, University of Minnesota student earns prestigious Hertz Fellowship, University of Minnesota tops new honors programs by Honorsadmin. Bookmark the permalink.